- ­	You can take chairlifts or even the Grandes Platières cable car to admire the view of Mont Blanc. In Flaine, the beginner lift pass works on a point card system. The point card is valid throughout the winter on the lifts specified. The point card does not give access to the Vernant sector. * During your stay, you may be asked to show proof of age at the ticket offices or on the slopes. Adult/child category basis: age of the person on the first day of validity of the lift pass bought. For those aged under 5 and 75+, free lift passes are only issued at our ticket sales offices upon presentation of ID (no administration fee). - Continue learning on green slope using the Coincoin, at the top of La Kédeuze's gondola lift. - ­	You can return to Morillon village on the Labérieu and Doina pistes (open depending on snow cover) and come back up on the Morillon gondola (2 return trips). In Morillon, the beginner lift pass is available by the day or for 4 consecutive hours (timing activated from the first passage through a ski lift turnstile). - ­	Improve your technique on a red slope and return by the Plateau draglift. 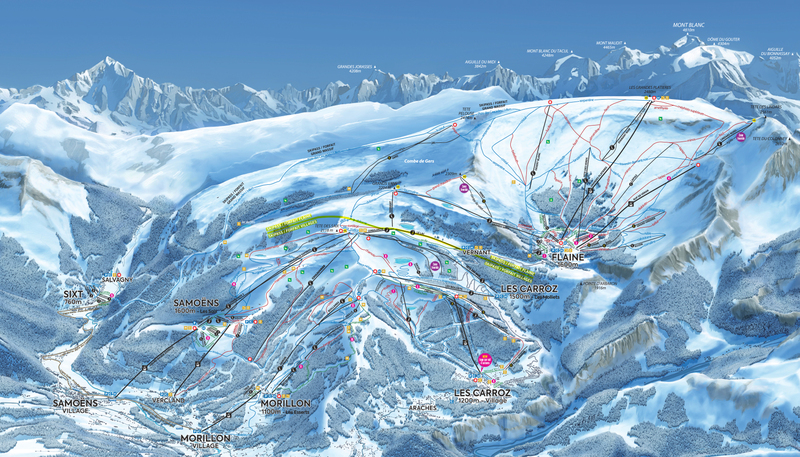 In Samoëns, the beginner lift pass is available by the day or for 4 consecutive hours (timing activated from the first passage through a ski lift turnstile). Buy your 6 days Grand Massif pass 60 days in advance and get it at the 5 days Grand Massif pass price! Simply click on the following links, enter your details (single or group) and complete your arrival date. If your arrival date is more than 60 days away, the 5% reduction is applied automatically. Offer valid on the 6 days Grand Massif lift pass only, cannot be combined with the Family pack.